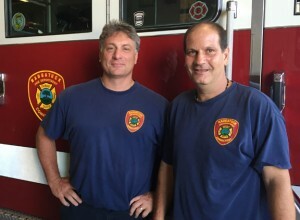 NAUGATUCK — They will tell you, to a person, that being a career firefighter is not for everyone. Firefighters work nights and weekends. They leave their families on holidays to make sure other families are safe. They rush into burning buildings to save people and property, remove drivers from cars that have crashed and often see horrific events that never leave the mind’s eye. Lt. Glen Noll, firefighter/assistant mechanic James Ricci Jr. and firefighter Leonard Patterson were all hired by the Naugatuck Fire Department on the same day, Aug. 6, 1990. On Aug. 4, they all officially retired before the Board of Mayor and Burgesses. Ricci and Patterson, who were working at the downtown headquarters Aug. 4, walked over to Town Hall to thank burgesses and Mayor Robert Mezzo for the opportunity to serve the borough and the public. On Aug. 6, Noll worked his final shift at the East Side Fire Station on May Street. While he and co-workers cooked steak sandwiches, he spoke about how much he would miss the profession. Noll, who has been an officer for 15 years, said he doesn’t mind jumping in to help someone at a motor vehicle accident or even entering a home that is on fire. It’s what he is sworn to do and he takes pride in saving people and property. As an officer, Noll said, it has been his responsibility to make sure the firefighters who respond to difficult scenes are doing well both physically and mentally when they return. It’s a responsibility he has taken seriously because he cares about his fellow firefighters. At the downtown headquarters on Old Firehouse Road, Patterson and Ricci explained that they do the job to help other people. He called fire service a brotherhood and a second family. Patterson, who started his career in emergency services as a volunteer on the Terryville Ambulance Association, said he will miss the friendships he has made throughout his career. And he will miss the ability to help people in Naugatuck, either through day-to-day firefighting or the several community nonprofit organizations that the Naugatuck Fire Department donates to. Ricci said that in the beginning, he viewed firefighting as more of a hobby than a career. He started as a volunteer in the Yalesville Volunteer Fire Department in 1986. Still, he said, the ability to help people in their darkest moments is gratifying. Three months ago, Ricci was reminded of why emergency responders are so vital to a community. He and Patterson were washing a fire engine when someone said there was a woman with a thank you card in the doorway. It was the mother of a 12-year-old girl, Jada Ivory, who drowned in the Naugatuck River on May 12. The Naugatuck Fire Department and firefighters from other local communities joined Naugatuck police officers and the Naugatuck Ambulance Association for hours searching for Jada. They did all they could to save her but she had been under water for about an hour before firefighters located her.